It was a course project in my junior year, and I’ll never forget those days we stayed so late at the department building, cutting and gluing the foam core board. The project lasted for about 3 months, including the proposal, game rule design, the making of the props, pilot testing (ourselves) and improvement, finding target users to be our real players, and the final presentation to the staff in our department library. 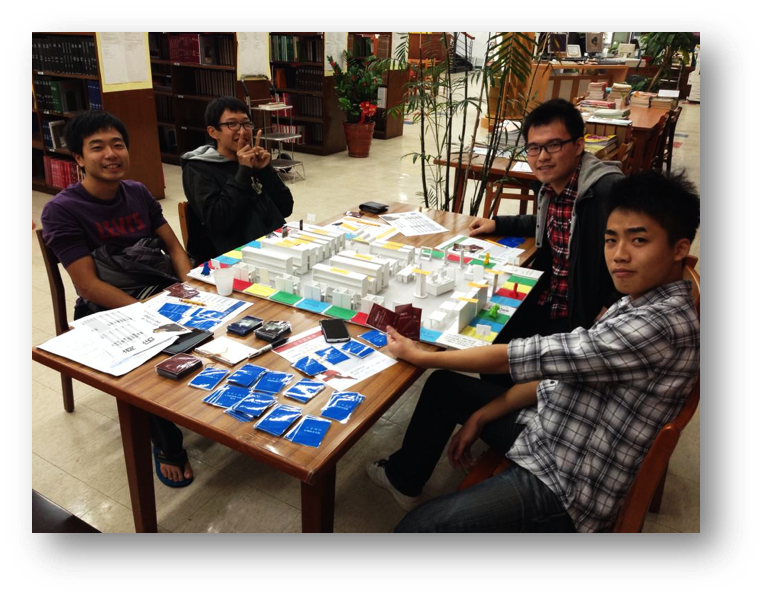 The target users of our monopoly game can be classified into three groups, which are: freshman students in the department of Library and Information Science, other students from the department of LIS, and those who are interested in using the department library. In our proposal, we defined these three kinds of users as our TA, but the very important target user group is still the freshman student in LIS field. Because they are supposed to be trained as information specialist or librarian, they should know the collections and resource in the department library better. These three kinds of users were asked to participate in the real game and give us feedback later in our testing phase. We were asked to propose a solution under the scope of "the navigation of department library and library user education". After the group discussion, we found that the main problem of LIS department library is - the low use of facilities and collections. People only come to LIS department library for printing, restroom, or borrowing reference that assigned by the instructor in our department. So, we started to think about the goals that we aimed to generate in order to solve the problem that we mentioned. We wanted to achieve the goals of providing the basic knowing of the department library, raising the use of library collection and resource, raising the use of facilities in department library, also helping the information literacy of the users. And we believed that this could help with both LIS department library and the users. We started to brainstorm that: what/how would a freshman student, who doesn’t know anything about LIS department library, like to get the understanding about our department library? After some informal interview with the students in our department, we formed a creative idea to solve this question - WE HAVE TO DESIGN A GAME FOR THEM! Based on some research and testing in the board game Monopoly, we designed a four-player board game, embedded with a 3D floor plan model in the center of the layout board. Each player has a representative color, a matched color token, and a building of library which can tax the player who passes by. The property players get and trade are all collections, and there are chances/opportunities for drawing cards, in order to get the reward, the player has to answer the department library relevant question correctly, or complete a mission that is assigned by the moderator. Through the mission such as locating certain collection, finding the resource, and using certain service… players can get familiar with the environment of the department library, and understand the usage of the collection. This game lasted about 20 minutes, and we calculate the final score of each player to decide the winner of the game. We had one pilot testing by ourselves and three real games with different user groups in total. The game had been iterated and refined several times, not only the edit of game rule/content but also repair of the props. I'm a user experience designer with 3+ years designing experience and 15+ year creativeness - started from a chalk and blackboard idea when I was 7.